Complete Hormone Solutions » Did you know that your fingernails can provide clues to your overall health! Did you know that your fingernails can provide clues to your overall health! Ronald Grisanti D.C., D.A.B.C.O., D.A.C.B.N., M.S. Your fingernails can provide clues to your overall health — but do you know how to read the signs? Check out photos of seven nail conditions that warrant medical attention. With yellow nail syndrome, nails thicken and new growth slows. This results in a yellowish discoloration of the nails. Nails affected by yellow nail syndrome might lack a cuticle and detach from the nail bed in places. 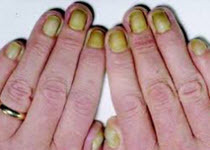 Yellow nail syndrome is often a sign of respiratory disease, such as chronic bronchitis. Yellow nail syndrome can also be related to swelling of the hands (lymphedema). Nail pitting is small depressions in the nails. Nail pitting is most common in people who have psoriasis — a condition characterized by scaly patches on the skin. 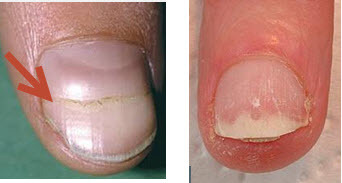 Nail pitting can also be related to connective tissue disorders, such as Reiter’s syndrome, and alopecia areata — an autoimmune disease that causes hair loss. Nail clubbing occurs when the tips of the fingers enlarge and the nails curve around the fingertips, usually over the course of years. 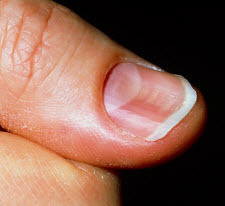 Nail clubbing is sometimes the result of low oxygen in the blood and could be a sign of various types of lung disease. 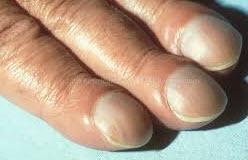 Nail clubbing is also associated with inflammatory bowel disease, cardiovascular disease, liver disease and AIDS. Spoon nails (koilonychia) are soft nails that look scooped out. The depression usually is large enough to hold a drop of liquid. Often, spoon nails are a sign of iron deficiency anemia or a liver condition known as hemochromatosis, in which your body absorbs too much iron from the food you eat. Spoon nails can also be associated with heart disease and hypothyroidism. Terry’s nails is associated with the tip of each nail having a dark band. Sometimes this can be attributed to aging. In other cases, it can be a sign of a serious underlying condition, such as liver disease, congestive heart failure or diabetes. Beau’s lines are indentations that run across the nails. 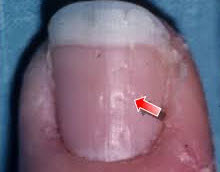 The indentations can appear when growth at the area under the cuticle is interrupted by injury or severe illness. Conditions associated with Beau’s lines include uncontrolled diabetes and peripheral vascular disease, as well as illnesses associated with a high fever, such as scarlet fever, measles, mumps and pneumonia. Beau’s lines can also be a sign of zinc deficiency. 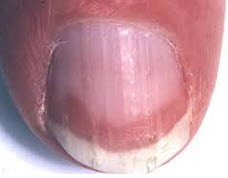 Onycholysis is associated with the fingernails becoming loose and separating from the nail bed. Sometimes detached nails are associated with injury or infection. In other cases nail separation is a reaction to a particular drug or consumer product, such as nail hardeners or adhesives. Thyroid disease and psoriasis — a condition characterized by scaly patches on the skin — also can cause nail separation. Your nails can provide a missing key to a critical diagnosis. Unfortunately, this is something that is commonly overlooked. Functional medicine practitioners have been trained to go the extra mile in clinical investigation including the review of the nails. The information on this website is not intended to replace a one-on-one relationship with a qualified health care professional and is not intended as medical advice. It is intended as a sharing of knowledge and information from the research and experience of Dr. Grisanti and his functional medicine community. Dr. Grisanti encourages you to make your own health care decisions based upon your research and in partnership with a qualified health care professional. Visit www.FunctionalMedicineUniversity.com to find practitioners thoroughly trained in functional medicine. Look for practitioners who have successfully completed the Functional Medicine University’s Certification Program (CFMP) www.functionalmedicinedoctors.com. This content may be copied in full, with copyright, contact, creation and information intact, without specific permission, when used only in a not-for-profit format. If any other use is desired, permission in writing from Dr. Grisanti is required.